The increasing demand for corn stover feedstock also raises concerns about agricultural and environmental sustainability. 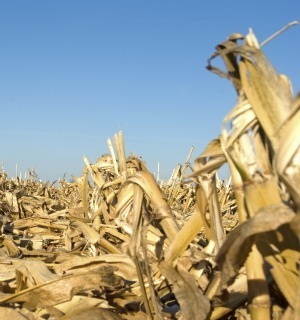 The amount of corn stover that can be sustainably collected is estimated to be 80–100 million dry tonnes/yr (t/yr), a majority of which would be available to ethanol plants in the near term as only a small portion is currently used for other applications. Potential long-term demand for corn stover by non-fermentative applications in the United States is estimated to be about 20 million dry t/yr, assuming that corn stover-based products replace 50% of both hardwood pulp and wood-based particleboard, and that 50% of all furfural production is from corncobs. The shift from fossil resources to renewables for energy and materials production has been the driving force for research on energy analysis and environmental impact assessment of bio-based production. Determining how much residue can be sustainably collected depends mainly upon two most direct and critical factors: residue yield and the minimum residue requirement for either maintaining SOC (soil organic carbon) level or preventing soil erosion. Many other constraints need to be addressed. Biomass quality and harvest and logistic costs are major limiting factors that need best solutions and management form the field to the biorefinery. How to harvest and process corn stover to maximize its quality as a fuel or industrial feedstock and minimize material losses are compelling issues in the industrial utilization of this raw material.